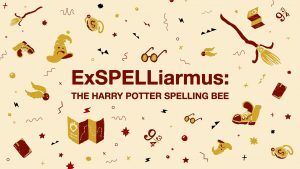 ExSPELLiarmus: The Harry Potter Spelling Bee! Wands at the ready, witches and wizards! Join us on September 15 at the Amsterdam Bar & Hall for the third annual ExSPELLiarmus: The Harry Potter Spelling Bee! Down a tincture of Felix Felicis and test your mettle at the spelling bee that exclusively features words from the wizarding world! $17 to play; $6 to watch. And you get a free pint of Butterbeer for registering! And every word you spell correctly will earn you a shot of Polyjuice Potion or a Butterbeer! COSTUMES ARE HIGHLY ENCOURAGED and PRIZES WILL BE AWARDED! Registration starts at 6:00pm, and the magic begins at 7pm! Prizes include items from our awesome partners: Source Comics & Games, Magers & Quinn Booksellers, Trapped Puzzle Rooms, Amsterdam Bar and Hall, and more!